PHOENIX – Phoenix may be the first U.S. city to build a mill to remanufacture plastic containers. It’s an effort to clean up one part of a global trash problem that’s been mounting for decades and is only getting worse. Curbside is where recycling ends for most of us, but for the city, it’s just the beginning of the process. “Yogurt cups, different things – not the common ones like your water bottles and soda bottles because we have good markets for those – but other types of mixed plastics,” said Joe Giudice, assistant public-works director for the city. He’s has been collecting bids from contractors so Phoenix can remanufacture specific plastic containers into new goods and fuels. “Phoenix’s approach is, ‘Hey, we want to develop new markets,’ ideally domestic markets, and we want to have something right here in Phoenix,” he said. Proposals were due back to the city on July 18. It’s been more than six months since China stopped importing most plastic and paper waste from U.S. cities, which it was remanufacturing and selling there. China’s decision, spurred by pollution concerns, has left an immense void. There is no other market in the world as large, that consumes as much as China – not even the U.S. That means the business flow of recycling essentially has come to a stop worldwide, and more paper and plastic are winding up in landfills. In 1950, estimates say, we created 1.7 million tons of plastic. In 2014, the total was 311 million tons, according to Adam Freed, principal at Bloomberg’s Sustainability Desk in New York. Overfull landfills aren’t the only problem. In a 2015 study, researchers found that 20 countries are responsible for more than 80 percent of the plastic going into the ocean annually. Odile Madden, a senior scientist with the Getty Conservation Institute in Los Angeles, said plastic consumption and use is a cultural problem. In just the past 20 years, there has been a noticeable rise in “convenience plastic”: water bottles, straws and cutlery, used once and thrown away. It’s a key component of America’s throwaway culture. 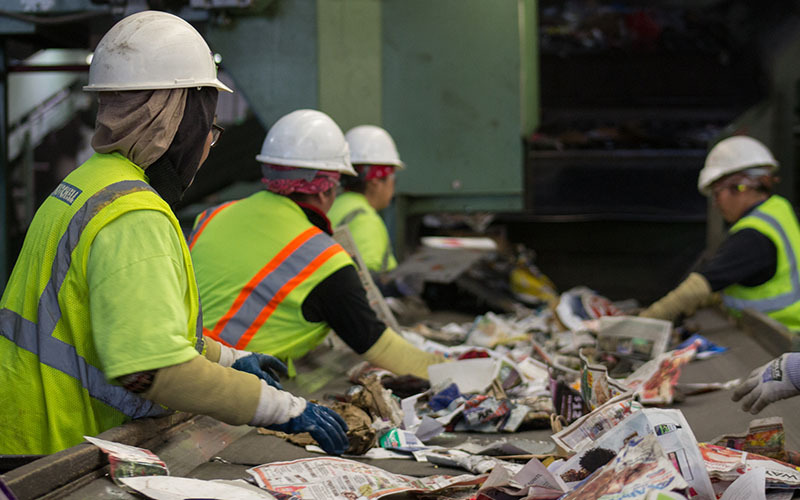 Freed said even if the recycling industry eventually finds a way to capture more of what can be recycled, there’s still the problem of landfills reaching capacity. Western states have about 20 years left, he said. A 2017 comprehensive research study on the history of plastic production says plastics outpace every other manufactured material for the past 65 years. According to the EPA’s figures, Americans generated 14.3 million tons of plastic waste in 2014, the last year EPA data was made available. Of that, 2.1 million tons, 14 percent, were recycled. But officials from Phoenix, Republic Services and other industry experts put the figure closer to 8 or 9 percent. The 2017 comprehensive found plastic recycling in the U.S. has remained steady at 9 percent since 2012. According to a report released at Davos by the World Economic Forum, one truck of plastic waste is dumped into the ocean every minute. Madden says it all comes down to our changing attitudes and expectations of what plastic actually is. Just 5 to 8 percent of any consumer plastic gets recycled. The bulk of the remainder gets landfilled, as it has since consumer plastic products became part of society in the 1950s. Giudice, the public-works director for Phoenix, says building a plastics remanufacturing plant in town is simply about responding to what residents say they want, which is to recycle more. “The vast majority of plastics that come in have nice domestic markets for those products to made into something else. But these mixed plastics, where we had a market in China, we no longer do,” he said.